CCF has been working to make an impact in L.A. for over a century, and Shirley Young has been a part of the Foundation for almost a quarter of it. 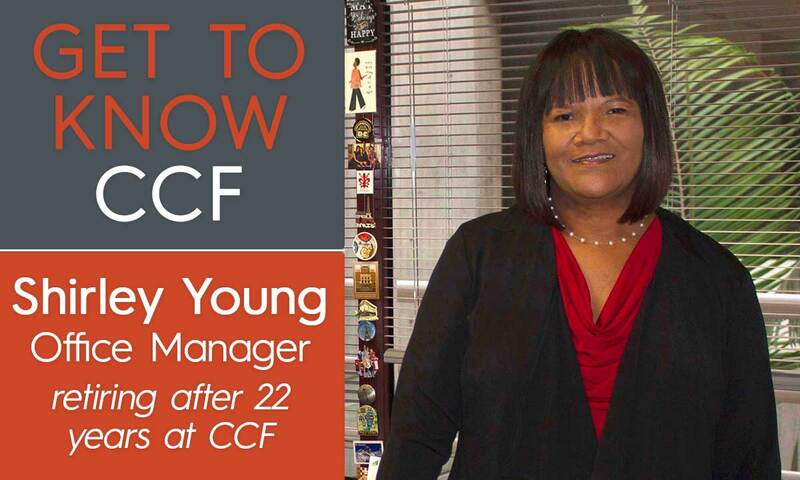 Her 22-year tenure at CCF has seen her elevate from a temporary clerk typist to the Foundation’s office manager. Now, she is embarking on an entirely new journey: retirement. While this is a time of great change for Shirley, who is looking forward to spending more time with her husband, sons, daughter in-laws and growing granddaughters, one thing remains the same. She will continue to dedicate her life to improving the lives of those around her. But before she leaves, we asked Shirley to share her memories and a bit of what she learned during her time at CCF. Question: What inspired you to work for a Foundation like CCF? Shirley: The things that we represent like improving health access and supporting education and our immigrant communities. Seeing that gave me enough incentive that I knew that I wanted to be a part of this place. I came here as a temp for only 90 days. So at the end, when they asked me to stay on, I was so excited. I knew I had a found a home. I found a place where I could work and give back to the community at the same time. The clerk typist position led to a promotion which I was thrilled about because then, I could do my job as office manager to help everyone else in the office give back. Question: What is the most important thing you’ve learned about the people of Los Angeles in the 22 years since you started working here? Shirley: The most important thing I’ve learned is the need in L.A.; when you stop and look around, you can see the need in our communities is great. Our help is really needed. But that’s why we’re doing what we’re doing, in order to make a difference in people’s lives. Question: Can you describe a change that you’ve seen during your time here that had a lasting impact? Shirley: In 2006, the $250 million Joan Palevsky gift. That was a historic moment for the California Community Foundation because at the time, it was the largest donation we had ever received. It was unrestricted which was very important because we could use it to directly address need, whatever it may be. I’ve been here a long time and I’ve seen many changes but that was one of the biggest. With that gift, we’ve been able to help so many people and launch several new programs and initiatives that are still serving the needs of our communities today. Question: What was your most memorable moment at CCF? Shirley: There were many, everything from the family picnics to celebrating birthdays and getting to volunteer in the community alongside each other. But I think one that sticks in my mind is the 100-year centennial celebration. The entire thing was just amazing but when we went out and spotted those beautiful angels throughout the communities of L.A. it was just really awesome. A true representation of the city of angels and a reminder that CCF is so intertwined in this city. Question: What parting advice do you have for the colleagues you are leaving behind? Shirley: Hold on to the pillars of life and stick to your core values. If you hold on to being trustworthy and honest in what you do, you will be effective. It doesn’t matter where you go, just take those values with you. It’s not how loud you say it but how you live it. You can have whatever you want in life if you just help enough other people get what they want. Other things are important but helping others is the most important and I think that’s what CCF represents. I know my mission is over here. So that only can mean I have a greater mission when I leave. Wherever I land, I know I’ll be helping people because it’s what I love to do. To hear more from our conversation with Shirley, please visit CCF’s Instagram page at Instagram.com/calfund and select the “Get to Know CCF” story series.